We love having company for dinner. And the first thing we do are drinks and appetizers. Sometimes we have a martini, othertimes a bar so that our guests can choose their potion, and then othertimes we start with wine. Our dinner parties are a moveable feast. Appetizers and drinks of choice are taken in one place, dinner in another. In fall and spring, we often start in the breakfast room and eat dinner in the dining room. 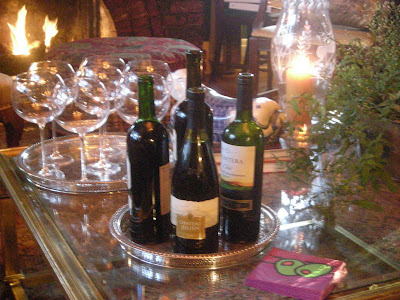 In winter, we take our drinks before the fire in the living room and dine in the dining room. 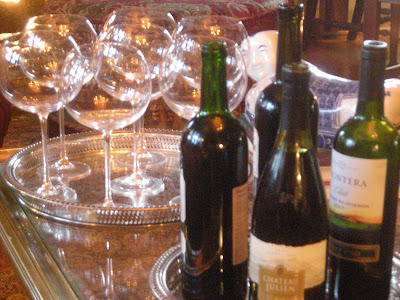 Saturday we had a dinner party and we started in the living room with wine. A selection of reds all poured into our balloon glasses -- made especially for red. The appetizer was roasted asparagus. Which went extremely well with the wine. A fun way to start a fun dinner party. Love how you start your dinners in different parts of the house during the season's. Your photo images are always a feast for the eyes. This beginning to a dinner party is so inviting. Always inspiring - must be fun to be a guest at Linderhof! Thank you for stopping by my blog and saying hi. Love the Kansas Prairie. Really like your 1920's house on the Prairie. Your Lavender Pound cake looks awesome and I can imagine how delicious it must taste. Wish we could visit over a cup of coffee and some of this cake. Hopefully I will get my act together and get pics on my blog. Your pictures are very nice. I'll check back later and read some more on your blog! Oooh, I would love to come to your house for dinner. What a lovely way to start the evening. Wasn't Foodie Friday fun? Your pound cake looks divine with the touch of lavender.